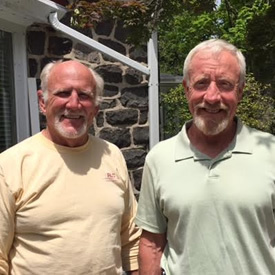 RLC Construction was formed by Principals Ray Cowan and Skip Faraglia, whose genuine caring, strong work ethic and superior skills deliver results that clients consistently rave about. The consultative and flexible approach RLC takes is designed with our clients in mind. Starting at the first meeting, RLC Principals Ray & Skip listen carefully to your thoughts, ideas, and concerns so they can provide recommendations to make things run as smoothly as possible and ensure that the project fits into your lifestyle with minimal disruption. Whether you’re planning a kitchen, bathroom, or basement renovation – or a major addition to your home – you can be assured that RLC will bring everything together to give you the highest quality results, unparalleled craftsmanship and superior value. And, based on your preference, we can coordinate with your architects and designers or recommend our specialists for any phase of the project. RLC is ready to make that project you’ve been thinking about a reality. Copyright © 2016 RLC Construction. All rights reserved.